Yuta Nihongaki and colleagues have recently published a paper in Chemistry & Biology where they have utilized a photoinducible dimeriza­tion system named Magnets to reversibly regulate Cas9 activity offering researchers a unique system for regulating gene expression. CRISPR-Cas9 system has become popular method of genome editing among researchers in a short period of time, allowing modifications of a cell’s genome by targeted genome modification as well as providing a platform for other modes regulation (transcription activation, repression, epigenetic modification). During genome editing a major concern is to control the activity of Cas9. Consequently there is much interest in controlling the spatiotemporal activity of the system. Nihongaki et al. make use of the split Cas9 system consisting of two proteins, one being the amino half of Cas9 and the other the carboxyl half of the protein. Each is incapable of interacting with gRNA. Nihongaki et al.attached photoswitchable proteins called Magnets to each half of Cas9 (based on Cry2/CIB interactions). One half had a positive Magnet (pMag) and the other a nega­tive Magnet (nMag) (paCas9-1). The p- and nMags heterodimerize in presence of blue light. When irradiated with blue light the Cas9 heterodimerized forming a functional nuclease in the presence of a specific guide RNA. When blue light is removed, the system becomes inactive again. 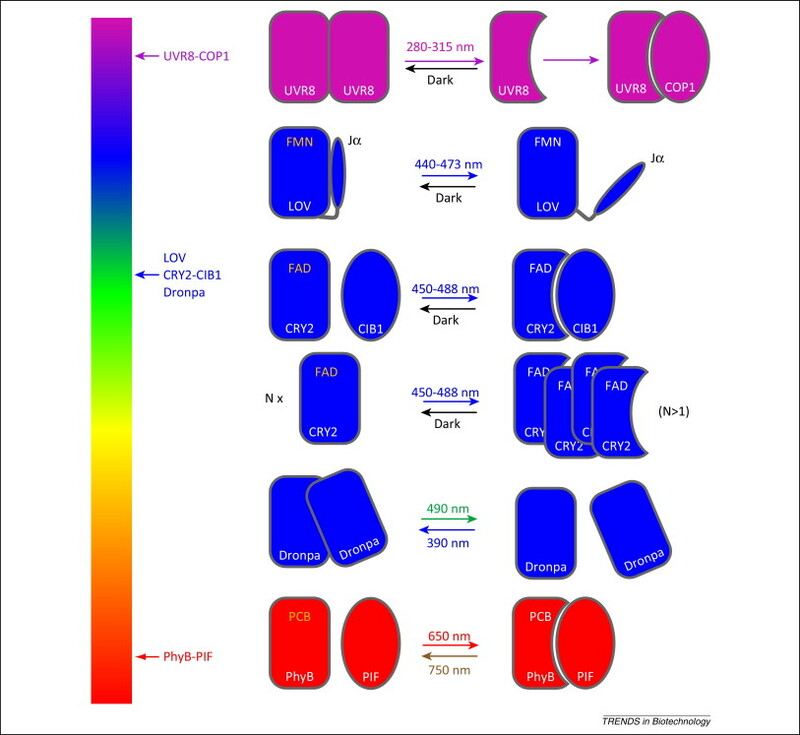 The authors concluded that this light activated “magnetic’ system recognizes PAM (protospacer adjacent motif) in the same way as full-length Cas9, because both have same PAM requirement and target specificities. They also showed the induction of indel mutation by paCas9-1 in mammalian cells and concluded directly proportional relation between frequency of indel mutations and the blue light irradiation. In response to light this paCas9-1 can induce both random indel mutations and designed genome sequence modification through HDR. The authors also describe making blue light inducible Cas9 transcription activators based on dCas9 (disabled Cas9 – no nuclease activity) p- and nMags. Briefly, they showed that paCas9 can offer spatiotemporal control of RNA-guided genome editing and transcription regulation in a reversible manner. Light-induced conformational changes in Cryptochrome 2 (Cry2) allowing the formation of a complex with Cry-interacting proteins (e.g. CIB1), eventually leading to changes in gene expression. Cry2 and CIB1 are useful for creating optogenetic tools. Now the next question arises about the utilization of such spatiotemporal and reversible properties of paCas9? Well this system has implications in diverse biological processes for dissecting of genes function and for medical applications, such as in vivo and ex vivo gene therapies. Also, paCas9 has the potential to reduce off-target indel frequencies in Cas9-based genome editing. This paCas9 platform has also emphasizing its significance in enabling conditional genome editing with high precision. The study of paCRISPRi also shows that it enables optogenetic control of targeted gene silencing. Hopefully this new powerful optogenetic tool using the “magnetic system” will open the avenues for many molecular biologists including insect biologist. Many insects have transparent or translucent cuticles that might make them candidates for the use of this opticogenetic technology.